I was excited to try this cereal. I was a big fan of another Kellogg's cereal called Caramel Nut Crunch. That cereal came out in 2006, but unfortunately only lasted about 2 years. I still hold that it had the best clusters of any cereal to ever have clusters. I was hopeful that this new cereal would be a re-working of the cereal I loved so much. It's not. This new cereal, Caramel Pecan Crunch, is okay. 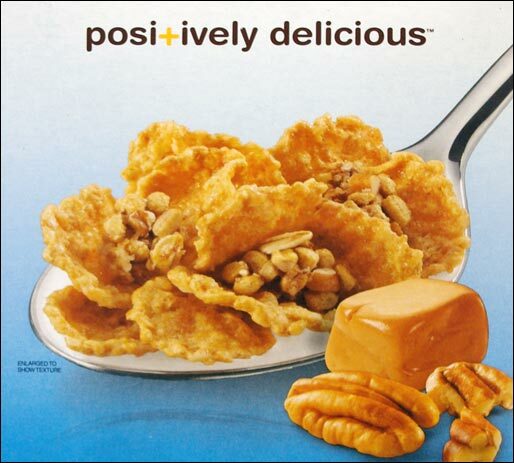 It stays crunchy in milk and it does have the caramel and nut flavors the box promises. Nutritionally, it's a fairly decent choice. The first ingredient is whole grain wheat. Each 3/4 cup serving has 9 grams of dietary fiber and only 1.5 grams of fat (0 saturated and 0 trans). On the negative side, this cereal has too much sugar. 12 grams per serving isn't disgraceful, but it's pretty high for a cereal that touts its own health benefits. My major beef isn't nutritional. The sugar content of this cereal is just enough to push the taste from enticingly sweet to annoyingly sweet. By the end of a bowl, the sensation of sweetness obliterates the nuances of caramel and nut. The same day I tested this cereal, I tried another new cereal called Cocoa Puffs Brownie Crunch. That cereal has a cartoon bird on the front of the box with chocolate dripping off of his beak. Which of these two new cereals do you think had the most sugar? The new FiberPlus has 3 more grams of sugar per serving than the new Cocoa Puffs. 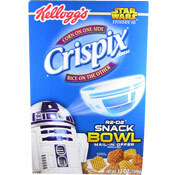 I wanted to love this cereal. I really, really did. I did not. 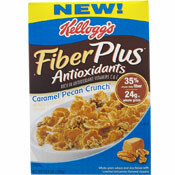 What do you think of Caramel Pecan Crunch FiberPlus? I agree. The flavor is okay in general, but it is too sweet. I thought it was awful! Too sweet - and the caramel flavor tasted like musty cardboard. Just a terrible cereal all around!